ALS. 1p. Grove Lodge, The Grove, Hampstead, London, NW3. June 23rd 1927. To "Dear Sir". 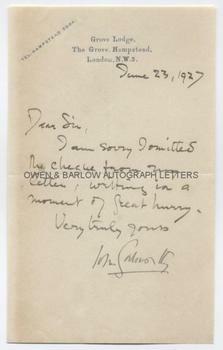 I am sorry I omitted the cheque from my letter, writing in a moment of great hurry." 8vo. Approx 8 x 5 inches. In very fine condition.